Non-financial corporations' investments decreased further in the last quarter of 2013 and the profit share of non-financial corporations contracted slightly due to poor value added development. Households' saving rate continued to grow in the last quarter. Adjusted disposable income describing households' economic well-being contracted somewhat in real terms from the corresponding quarter last year. These data derive from Statistics Finland’s quarterly sector accounts. In the last quarter of 2013, the profit share of non-financial corporations, or the share of profits in value added, decreased by 0.5 percentage points to 22.6 per cent from the previous quarter. The investment rate of non-financial corporations, or the proportion of investments in value added, fell by one and a half percentage point to 19.5 per cent. The key figures were calculated from seasonally adjusted time series. Households' saving rate was 1.9 per cent in the fourth quarter of 2013. In the previous quarter, the figure was 1.4 per cent. Saving rate refers to the proportion of savings in disposable income. In the fourth quarter, the investment rate of households accounted for 11.6 per cent of disposable income, which was around half a percentage point lower than in the previous quarter. Most of households' investments were investments in dwellings. 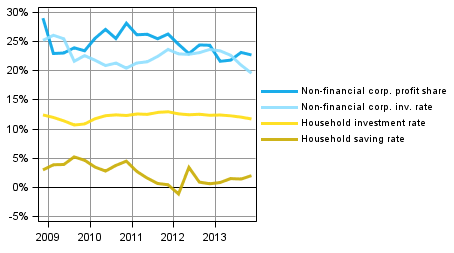 Households' adjusted disposable income decreased slightly in real terms from the respective quarter of the year before. Adjusted income is the indicator recommended by the OECD for evaluating the economic well-being of households. Adjusted disposable income is derived by adding individual services produced by the public sector, such as education, health and social services, to the disposable income of households. Sector accounts are calculated only at current prices. However, a volume indicator describing the development adjusted for price changes is calculated for households' adjusted disposable income in a separate Appendix table. The profit share, saving rate and investment rate are calculated from net figures, which means that consumption of fixed capital is taken into account. Households do not include non-profit institutions serving households. ISSN=2243-4992. 4th quarter 2013. Helsinki: Statistics Finland [referred: 21.4.2019].